Pyramid's Fire-Flex Plenum Duct, Halogen Free Riser Duct, Riser Duct, and General Purpose Duct are UL listed nonmetallic flexible raceways. 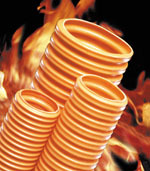 Fire-Flex Plenum Duct is for installation in ducts, plenums, risers or other environmental air spaces. 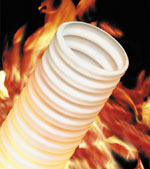 Fire-Flex Halogen Free (HF) Riser Duct releases zero halogens upon combustion. Fire-Flex Riser Duct is for installation in vertical runs or shafts, and capable of preventing the spread of fire between floors. Fire-Flex General Purpose (GP) Duct is pliable, nonmetallic fire-resistant raceways for installation in general-purpose applications.